Tell us a bit about yourself, your background? First of all, thank you, Neha, for having me over on your wonderful blog. I am a civil engineer turned blogger turned author. I have published two novels, one novella, a few short stories in various anthologies and a few kids’ books. I also edit manuscripts. I have also an avid interest in portraiture and graphic designing. How did the idea of writing a book come up? The thought to convert an idea into a book came quite by chance. To be truthful, I saw the story of my first book in a dream. I noted down the major scenes and characters once I woke up. Then I tried expanding it into a novel and succeeded in it. All I had written before writing my first book were a few short stories in inter-collegiate story writing competitions. The fact that I won the top prize both times might have been an indicator as to where I was headed eventually. What do you mean by being a self-published author and difference between traditional publishing? Self-publishing is a misnomer in a way. It is indeed the form of publishing where the writer is in charge of everything, the editing, the cover, the proofreading and marketing. Everything is under our control. We even decide the release date. But we don’t do it all ourselves. In self-publishing, the author need to find the professionals to do the above works and pay them from his/her own pocket. In traditional publishing, though, you just submit your completed manuscript to the editorial team at the publisher. They do the editing, proof reading, cover design and releasing the book in print and eBook forms. The writer is paid an advance upon signing the contract. The publishing rights remain with the publisher for the contract period. The con about the traditional publishing route lies in its unpredictability. Even if you submit a manuscript and sign a contract, you do not have much control over the cover design, release date or the final shape of the manuscript. A book may get published years after you submit it to the publisher. The con of self-publishing is that the future of the book will depend upon the professionals the writer chooses to invest on. How was the journey to being a self-published author like? I have had a rollercoaster ride as a self-published author. 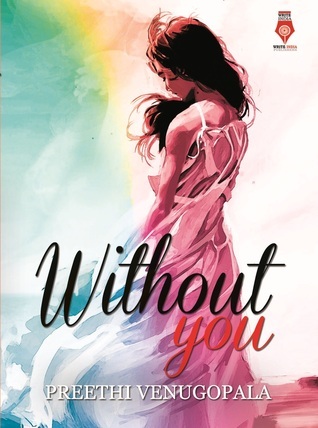 My first book ‘Without You’ as of today has 268 ratings on Goodreads and 62 reviews on Amazon. All of them organic. 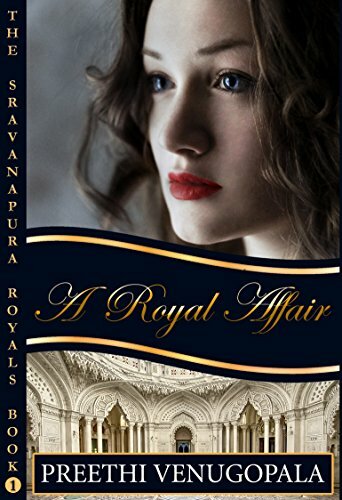 I have published my second novel A Royal Affair which is also being received well. But my path was not without roadblocks. I saw all the ups and down that comes in the way of a self-published author. There were haters who did what they could do to pull me down. But there were also readers who wrote me long letters and suggested my book to others. I am thankful that most part of the journey has been pleasant. Your memories associated with the first book? First book is always close to heart. I still remember biting off all my nails waiting to hear from my first beta-reader. If I hadn’t got the encouragement I got from her at that stage, I wouldn’t have become an author today. I remember the happiness I felt the day the book was launched, signing the book for friends and readers and posing for photos. I remember the first mail from a reader and also the first review I received. Such things will always be cherished. How did becoming a self-published author help? I began as a traditionally published short story writer. All my short stories (5 stories published in different anthologies) got me readers. From these, I didn’t earn even a rupee. But after I self-published my first novel, I began to earn from my writing. Also, I began to be recognised as an author. My submissions to traditional publishers were given more importance than before. Recently, I signed two contracts with Juggernaut books. One for a single short story and the other for 9 short stories. I was paid for my work. In a way, self-publishing made the journey to become a traditionally published author easier. Is it a satisfying alternative? It is a very satisfying and easy way to earn from your writing. When you are a self-published author, you get to know the exact details of the number of books that are being sold, the number of pages that are being read and also the region where the book is being read or bought by logging onto your Amazon KDP account. It doesn’t matter whether your book is selling thousands of copies per day or just a few copies. Every detail is available to you. All these details are never available to any traditionally published author without the data being tampered with by the publisher if I believe the tales I heard from many of my traditionally published author friends. With Amazon KDP, it’s very easy to become addicted to self-publishing because of this transparency. I know many other self-published authors as well who are making a living just from their eBooks. Another point is you don’t need to wait for long to see your book published when you are self-publishing. If you’re going through the traditional route, there is a waiting period of minimum 6 months or a few years to get your book published. Using Amazon KDP, your book gets published within a day and it becomes available to the reader immediately. You have recently released your latest book, tell a bit about that? A Royal Affair is a story about second chances in love and a unique quest to find a lost relative in India undertaken by a British girl. It is my second published book though technically it is my third completed manuscript. It tells the story of Jane and Vijay, lovers who were separated by circumstances, and thrown together again years later. It was a very interesting book to write as I have never written a foreigner as main character or about a royal family in any of my stories or novels. How much have you evolved from your first book to now? When I published my first book, I didn’t know anything about self-publishing. But over the years, I have learned a lot through trial and error. I guess I have become a better writer after I graduated from Anita’s attic last year under the able guidance of Anita Nair. Your tips and suggestions for those looking to be a self-published author? Over the years I have learned quite a few things about self-publishing yet every day comes with new insights. This might sound silly but only a good book sells. Just putting anything out there doesn’t work. Readers are the gatekeepers in self-publishing, and unless your book satisfies them, they won’t consider buying you next time. So, learn to plot, structure and write according to your genre. Don’t publish without getting your book edited by a professional editor. Even if you are a good editor yourself, don’t publish what you edited yourself. Our brain camouflages errors we make. But another person will be able to spot these errors better. Beta readers will tell you whether your book is working. Find someone who loves reading the genre you write. Don’t send your romance book to a reader who reads only thrillers. Your book cover can make or break your book in a way. If your book cover doesn’t appeal to a reader among the many book covers on Amazon, they might not buy it. In self -publishing it is very important to market your book well. 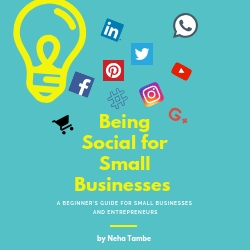 If you don’t post about your book on Social Media, nobody is going to know about your book or buy it. So, do not be ashamed about bragging about the reviews or best-selling ranks to your followers. You have to build an interest in the readers about your book. Some invest a lot of money in this, but I believe you should not invest too much in this area. If you have built an author platform on social media, that works best than paid marketing. 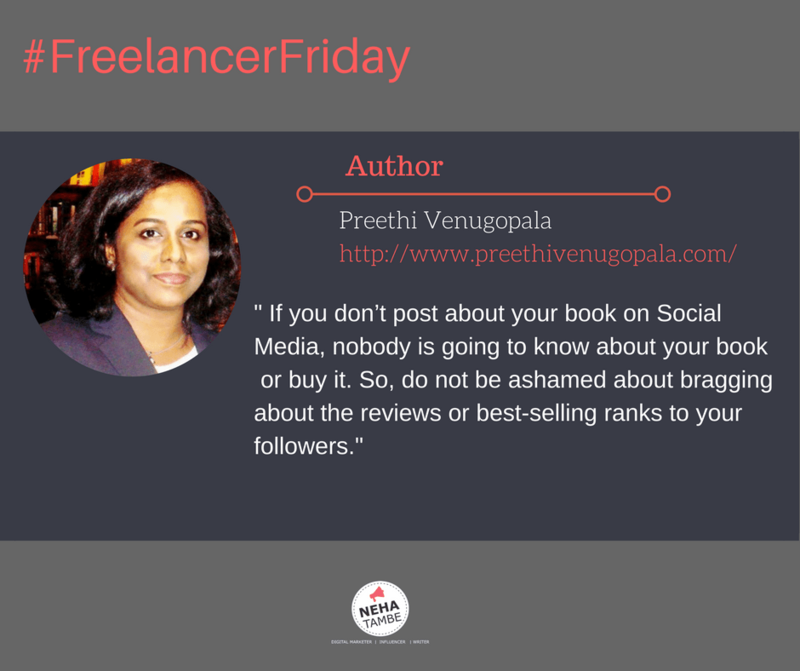 Thank you Neha for featuring me on Freelancer Friday. I enjoyed answering your questions. Wishing Preethi more power and more books! I hope to write some day too, but it looks so hard! Very inspiring. Loved it. Wishing the best for Preethi. Wud love to read her books. Preethi is a wonderful story weaver and editor. She inspired me to get published and for her I’m an author in 3 anthologies today. Thoroughly enjoyed the interview. Preethi has given a very clear picture of self publishing. It’s a guide for those (including me) who want to become a self publishing author. Thanks Neha for the introducing Preethi to us. Thank you for sharing this journey. I myself want to write a book sometime in future. This is such an inspiration. Waoh. I love this Self Publishing Series. Love a The Wonderful Tips shared here. Thx for Sharing..